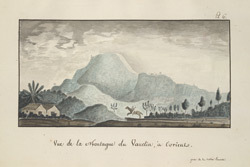 This is a sketch of the peak of the Vauclin, on the island of Martinique. The sketch was drawn by Alexandre Moreau de Jonnès, an officer in the French Navy who was stationed on the island in the early 19th century. The Vauclin is 1657 feet in height and is covered in rich vegetation. In the foreground of the sketch a rider on horseback can be seen.